I've never made cake pops before, mostly because it just seems like so much work. Thanks for the tips. Now I think I can actually try to make some. This is a fantastic idea example of of not making a kid's food decorative and attractive. Colors are good specially The peachy pink is great. You put two different candy melts in a bowl, swirl it a bit with a toothpick. 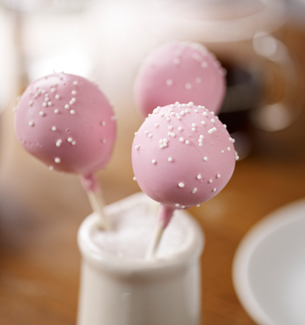 Then dip your cake pop. I can't seem to stop them from dripping - I dip, put in the holder, sprinkle and if i don't put them in the fridge fast, they drip everywhere... and I'm only to get 3 at a time done. What's your trick to such beautiful pops? I'm so frustrated. Is my candy dip too think you think? @Andrea I shake the excess chocolate off. Are you using candy melts? I never had a problem with dripping. After I dip, I hit the stick on the cup's rim a few times to shake the excess chocolate off. It dries pretty quickly, sometimes I don't even put enough sprinkles on them due to quick drying. I don't add oil/shortening to my dip at all. I just melt the candy melts and dip, shake a little, and sprinkle them. Most louis vuitton online companies take photos that are submitted electronically and transfer them to polyester panels. The cheap hermes handbags fabric is dyed by specialized processes that will keep the cheap chanel shopping photo in top condition for years of use. The photo panel will not crack, peel or fade. Then, the miu miu hobo panel will be sewn into a one-of-a kind handbag. Some companies can create omega watches for sale featuring removable panels, which can be switched as the user desires. If the Evening Dresses has a removable panel, the photo image will be printed on a separate fabric piece that snaps onto the body of the womens jackets. That is a great recipe! It look delicious and beautiful. Thanks for your sharing!